Does The Elipse Embroidery Hoop Package Offer Everything That Buyers Are Hoping For? The Elipse 4-Hoop Embroidery Package with Embroidery Thread and Scissors offers what you would expect from the name: a set of four, useful embroidery hoops. In this case the XL 5×12″ 3-position hoop, large 5×7″ hoop, small 4×4″ hoop and XS 1×2.5″ pocket hoop – as well as some nice little extras to get sewers started. 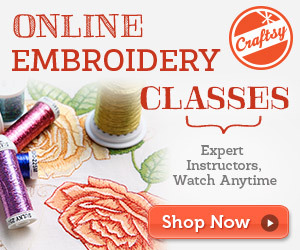 The kit is designed to be the perfect starting point for those switching to embroidery and a way of making the craft even more accessible but is this really the case? What benefits have sewers enjoyed after buying this Elipse Embroidery Hoop Package? The important thing to remember about this product is that it is a big set of different tools rather than one simple item and this means that buyers have highlighted the extra features and the sense of value as positives in their online reviews. The set includes a large number of hoops that would cost a lot more if they were bought separately, all of which have the potential to improve the act of embroidering with a machine, but it also comes with coloured thread and the amusingly-shaped scissors so users can start straight away. The product description talks about the convenience of the different hoops and the time saved by being able to overlap them and nobody appears to be contesting this, suggesting that buyers are happy with the new opportunities on offer. In addition to this, buyers have also praised the feel of these “high-quality, durable hoops”, saying that they seem sturdier than others they have purchased in the past. Does this Elipse 4-Hoop Embroidery Package set have any disadvantages that buyers should know about? The majority of the reviews for this product are positive, reflect the sales pitch by talking about the great function and quality of the items provided and mention very few complaints. For the sake of balance, the tiny niggles and isolated problems that did creep in should be noted. The most common problem is the idea that attaching these hoops to the sewing machine can be quite difficult – at which point it is important to remind buyers that the kit is only compatible with Brother machines. And others have reported minor issues such as the 4 x 4 hoop being damaged, the threads being tangled and there being no black thread included with the colours. Summary: should keen embroiderers buy this Elipse 4-Hoop Package? In the end, it is difficult not to recommend this machine to keen sewers because the positives that have been experienced clearly outweigh the negatives. The compatibility issues could be a problem for some, although the range of models listed is large, and there is a minor chance of items not being included or being damaged. However, most buyers are happy with the durability and value of the set and would buy another if required. This Elipse embroidery hoop package is more than just a set of simple hoops to attach to a sewing machine and it really doesn’t matter if there isn’t a black thread in the pack when the whole package seems to increase a buyer’s sewing potential and offer so much value. Find more information about this Elipse 4-Hoop Embroidery Package on Amazon here.